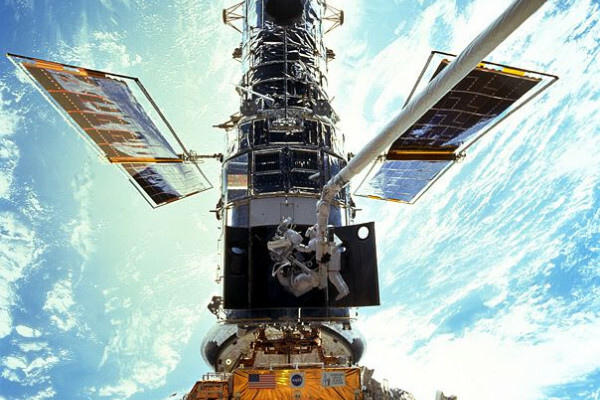 This week in science history saw, in 1990, the launch of the Hubble Space Telescope, the largest and most advanced extraterrestrial telescope that has allowed us an extraordinary insight into the furthest reaches of the universe and has also helped to determine the speed at which the universe is expanding. This year we're celebrating the 400th anniversary of Galileo Galilei's groundbreaking observations using one of the very first telescopes. The Hubble telescope is, unsurprisingly, pretty different to Galileo's, which would have used glass lenses. In order to see dimmer objects, the objective (main light-capturing) lens needs to be bigger. The only problem with this is that as the glass lenses get bigger in diameter, because they can only be held around the edges in order for the light to pass through them, they tend to sag in the middle, distorting the image. The solution to this has been to use mirrors, which could be supported from behind, to capture the images - a system first developed by Newton in the 18th century. Hubble's primary mirror is over 2 metres in diameter. The telescope was funded as a collaboration between NASA and the European Space Agency and was originally planned to be launched in 1983. However, several problems, including the Challenger disaster, in January 1986, where a NASA shuttle broke up on take off, delayed the launch. It was eventually launched on the shuttle Discovery in April 1990. But even once it was up in orbit, it was beset with problems. Scientists realised that the primary mirror used to capture the images had not been ground properly, and so in 1993 a servicing mission (SM1) was sent to rectify it by installing corrective optics. In 1994 NASA announced that the mission had been a success and released newly taken images showing much higher resolution. The telescope has been a part of some of the most important astronomical work of the 20th Century, including being used to calculate the Hubble Constant, named just like the telescope after the American astronomer Edwin Hubble. He proposed what came to be known as Hubble's Law, which suggested that the universe was expanding, and is still some of the main support for the big bang. The measurements taken by the Hubble telescope allowed scientists to estimate the rate of expansion much more accurately. The data collected by the telescope also supported the theory that most galaxies (including our own galaxy, the Milky Way) have a black hole at their centre, an idea first suggested in the 60s. It hasn't proven the theory, but the sort of radiation being emitted from these areas of space is consistent with the presence of what we currently understand as a black hole. One of the most exciting pieces of information gathered by the Hubble telescope is the collection of Ultra Deep Field images. These may not look much at first - a picture showing lots of slightly different shaped coloured points of light, but these are some of the furthest away galaxies in the universe that emit visible light. They are approximately 13 billion light years away, meaning that the light that is now reaching us from them was emitted 13 billion years ago - only a few hundred million years after the Big Bang. The ultra deep field images give us a glimpse of what the young universe was like. As well as all these, the images taken by the telescope of Galaxies like our closest neighbour Andromeda and of nebulae like the Eagle Nebula were like nothing the public had ever seen before and really gave people the chance to see a new side to the universe. As for the future for the telescope, another servicing mission is planned for May 2009, and after this the telescope could continue to operate up to 2021. In 2013, the James Webb Space Telescope is due to be launched. This will be a much more advanced telescope, but will only observe in the infrared end of the spectrum, which means it would not replace Hubble (which observes in visible and ultraviolet) but work alongside it to further astronomical research. The Hubble Space Telescope is probably the best known telescope of its kind around the world, and as well as proving invaluable to the world of astronomy, it has provided beautiful and extraordinary images of our universe that inspire and enthral the public.